Now I'm sure you've all heard of The Loose Caboose Cafe in Hindmarsh. If you haven't already eaten there, then you've probably drooled over the countless Instagram photos that constantly flood your feed with delicious brunch options, decedent desserts and picture perfect coffee. Call it quality journalism or just a creative excuse to brunch, we took a culinary adventure to The Loose Caboose Cafe, sampling both menu favourites, daily specials and some sweet treats. It didn't take long to realise why this little cafe is a local favourite. The converted heritage listed railway station in Hindmarsh is the unexpected home to The Loose Caboose cafe; unordinary but genius and innovative at the same time. The decor could be classified as cottage comfort, with hard wooded floors, exposed brick walls and large spring line windows. With that said, the space is also vibrate and bursting with colour, whether it be the brightly painted walls at the entry, colourful furniture dotted throughout or even the vibrant seasonal menu. There is a true sense of comfort and calmness in this space. Plus being two meters away from the train tracks is pretty cool! The first dish on our culinary journey at The Loose Caboose Cafe is the classic and ever so popular brunch option: Smashed Avo on toast. It's safe to say we have all had this dish before and know exactly what to expect... right? Wrong. The Smashed Avo that arrived on the table was nothing less than a piece of art work. The thick slice of sourdough bread was camouflaged with a generous serving of creamy avocado, feta, watermelon radish, beetroot puree and a herb-crusted, poached free-range egg. Vibrant strokes of red, green and yellow brought the plate alive. Flavour wise, the dish was a knock out. Creamy, salty, sweet and moments of sour created a harmonious flavour on the palette. The Baked Eggs was another standout dish with two large free-range eggs, cooked to a creamy-yolky perfection in a tomato and chorizo sauce. The chorizo added a beautiful smoky and spicy taste to the whole dish. Just between us, the baked eggs would make the best "i've had a big night" breakfast! 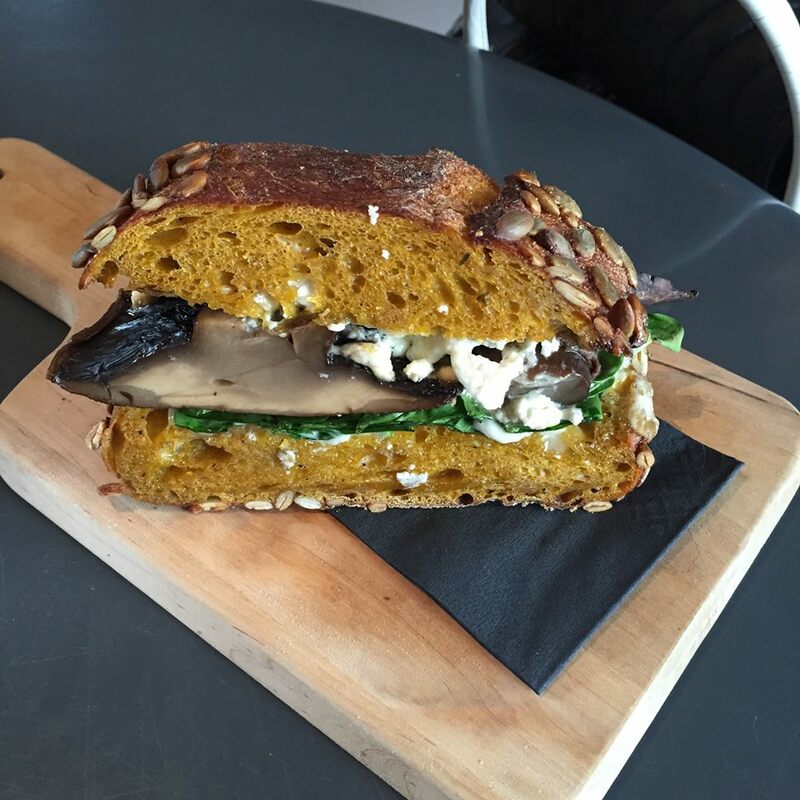 Not sure how often this gem makes an appearance in the cafe, but the mushroom and pumpkin bread sandwich is the perfect healthy, on the go lunch option. A generous serving of grilled mushrooms is accompanied with fresh greens and soft feta cheese, placed inside the most delicious pumpkin bread. The earthiness of the mushrooms, the saltiness of the cheese and the subtle sweetness of the pumpkin bread creates the most harmonious taste. Of course what would be a proper piece of journalism without investigating all aspects of your subject? Dessert was a caramel and chocolate slice, and boy was it good! Rich, crumbly, sweet and gooey, but hard to finish as it was very decadent. If you're not a huge sweet tooth, we'd probably opting for something else. How was the Coffee? Aromatic and rich in flavour, not too milky and definitely not too bitter. The Loose Caboose Cafe is certainly a brunch spot to check out. With a great food and drinks menu which includes daily specials, we're sure even the pickiest of eaters would find a favourite here. The staff are friendly and more than happy to make suggested and recommendations, while the atmosphere is cool, slightly quirky and relaxed.